Henry L Stimson. Digital image. Wikipedia. N.p., n.d. Web. 20 Apr. 2015. My name is Henry Lewis Stimson and I was born and raised in New York City. After my birth in September 1867 I was partly brought up by my grandparents. When I grew older, I attended Phillips Academy in Massachusetts where I graduated with honors. With my academic success in high school I was able to be accepted into Yale College. I am one of the known members of the Skulls and Bones Club and also one of the few people that were elected into the Phi Beta Kappa. Right after, I attended and graduated from the Harvard Law School. Worth mentioning is also the fact that I was a lifetime member of Theodore Roosevelt's Boone and Crockett Club which is where I met Mr Theodore Roosevelt. In 1906 I was appointed by President Roosevelt as U.S. Attorney for the Southern District of New York. In 1910 I also ran as governor of New York but I was defeated in the elections. In 1911, I was appointed as Secretary of War by President Howard Taft for my first term in the Cabinet. When World War I reached America in 1917 I was one of the 18 officers responsible for gathering and training a volunteer infantry division which was shortly after disbanded by the government. During the war, I served as an artillery officer and reached the rank of a colonel in 1918. After World War I ended I was appointed as Governor of the Philippines from 1927 until 1929, when I was brought back to America by President Hoover as Secretary of State. When WWII broke out I was returned to the position of Secretary of War for a second term. I was a leading role in the Japanese internment and also strongly supported the idea of using the bomb against Japan since they rejected the Potsdam. I also need to add that I was the leading supervisor and had direct connection to the Manhattan project. I also need to inform you that I got married to former Mabel Wellington White in July 1893 and never had kids. Lastly, I passed away in 1950 from a heart attack, 5 years after I retired from the Cabinet. I died at 83 years old. Connection to this Case: I am really connected to the case because I had a really important job for the government. I was one of the leading roles in the development of the bomb, but also was one of the people who supported an agreed to drop the Atomic Bomb. I was the presidents right hand man, so I had some influence on what the United States govenmentment would decide to do with anything that had to do with military or war. I am on this side because i support the president's actions and also beause I was the one who consulted the president about doing what he did. Your Testimony: All that President Truman wanted was to minimize casualties and protect not only his people but the world from the terrible experience of war but also from the Japanese. As a matter of fact I wrote a document that explained my personal views on the development and the use of the atomic bomb in 1947 named “The Decision To Drop The Bomb”. I don’t blame the people, I blame the Japanese government and especially Emperor Hirohito for brainwashing and making the Japanese people follow a road that leads to their own destruction. I need to state that both of these bombs were dropped on cities that played a major role in sustaining the military power of Japan and had a big influence in the perception of the rest of the world and especially the United States of America by the Japanese populations living in these cities. Hiroshima was the headquarters of the Japanese navy and Hiroshima was one of the industrial powers of the Japanese army. Furthermore, if the United States had proceeded on invading Japan on November 1st it would have cost a more lives than the combined casualties from both atomic bombs. Also it was very important to develop the Atomic Bomb first because at the time the United States and the United Kingdom were the only countries who had the supplies needed but also scientists who were familiar with the whole process of putting this weapon together. So, I can not emphasize more that this was the advantage the the United States had in order to have the military strength to protect its civilians from any more wars. Lastly, I would like to conclude by saying that the possible atomic weapon was considered o be a new and tremendously powerful explosive, as legitimate as any other of the deadly explosive weapons of modern war. The entire purpose was the production of a military weapon; on no other ground could the wartime expenditure of so much time an money have been justified... Had the war continued until the projected invasion on November 1, additional fire raids of B-20's would have been more destructive of life and property than the very limited number of atomic raids which we could have executed in the same period. The bomb thus served exactly the purpose we intended. The peace party was able to take the path of surrender, and the whole weight of the Emperor's prestige was exerted in favor of peace. When the Emperor ordered surrender, and the small but dangerous group of fanatic who opposed him were brought under control, the Japanese became so subdued that the great undertaking of occupation and disarmament was completed with unprecedented ease. 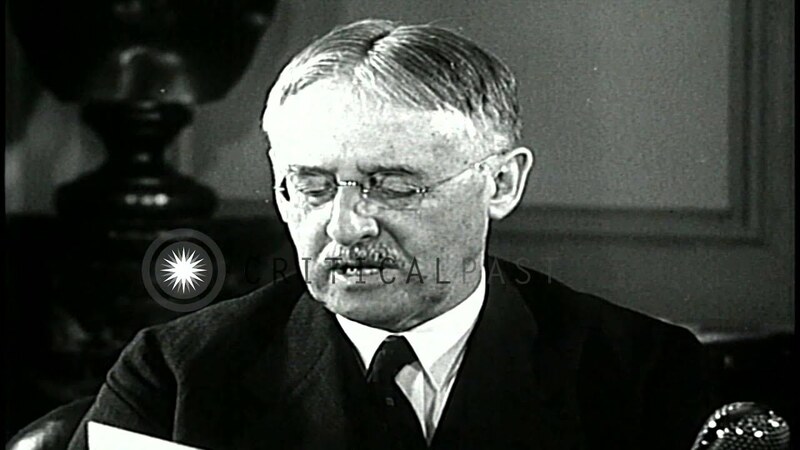 "Henry Stimson Speaks." Youtube. N.p., n.d. Web. 21 Apr. 2015. Purpose- Share with the world my views as well as the thoughts of some of my colleagues from my point of view, on the use of the atomic bombs against Japan. Value of this source in preparation of my testimony- This source gives an insight on what me and the president discussed and carefully examined before even considering using these weapons against Japan. It has all my key arguments as well as the strategical viewpoint of these operations that forced us into taking these actions. Also it provides information that was previously unpublished. Limitations of this source in preparation of my testimony- It is written by only me which means that these are only my thoughts on the subject despite the fact that they are supported with evidence. If I had written this document with another author it would have been more well-rounded. Purpose- To educate anyone interested into what events escalated to the final decision to drop the bomb but also teach Pearl Harbor's history. Pearl Harbor Attack | Japanese-United States History. Digital image. Encyclopedia Britannica Online. Encyclopedia Britannica, n.d. Web. 21 Apr. 2015. Pearl Harbor attack, (December 7, 1941), surprise aerial attack on the U.S. naval base at Pearl Harbor on Oahu Island, Hawaii, by the Japanese that precipitated the entry of the United States into World War II. The attack climaxed a decade of worsening relations between the United States and Japan. Japan’s invasion of China in 1937, its subsequent alliance with the Axis powers (Germany and Italy) in 1940, and its occupation of French Indochina in July 1941 prompted the United States to respond that same month by freezing Japanese assets in the United States and declaring an embargo on petroleum shipments and other vital war materials to Japan. By late 1941 the United States had severed practically all commercial and financial relations with Japan. Though Japan continued to negotiate with the United States up to the day of the Pearl Harbor attack, the government of Prime Minister Tōjō Hideki decided on war. Adm. Yamamoto Isoroku, the commander in chief of Japan’s Combined Fleet, had planned the attack against the U.S. Pacific Fleet with great care. Once the U.S. fleet was out of action, the way for the unhindered Japanese conquest of all of Southeast Asia and the Indonesian Archipelago would be open. On November 26 a Japanese fleet, under Vice Adm. Nagumo Chuichi and including 6 aircraft carriers, 2 battleships, 3 cruisers, and 11 destroyers, sailed to a point some 275 miles (440 km) north of Hawaii. From there, about 360 planes in total were launched. The first Japanese dive bomber appeared over Pearl Harbor at 7:55 am (local time). It was part of a first wave of nearly 200 aircraft, including torpedo planes, bombers, and fighters. The reconnaissance at Pearl Harbor had been lax; a U.S. Army private who noticed this large flight of planes on his radar screen was told to ignore them, since a flight of B-17s from the United States was expected at that time. The anchored ships in the harbour made perfect targets for the Japanese bombers, and since it was Sunday morning (a time chosen by the Japanese for maximum surprise) they were not fully manned. Similarly, the U.S. military aircraft were lined up on the airfields of the Naval Air Station on Ford Island and adjoining Wheeler and Hickam Fields to guard against sabotage, and many were destroyed on the ground by Japanese strafing. Most of the damage to the battleships was inflicted in the first 30 minutes of the assault. The Arizona was completely destroyed and the Oklahoma capsized. The California, Nevada, and West Virginia sank in shallow water. Three other battleships, three cruisers, three destroyers, and other vessels were also damaged. More than 180 aircraft were destroyed. U.S. military casualties totaled more than 3,400, including more than 2,300 killed. The Japanese lost from 29 to 60 planes, five midget submarines, perhaps one or two fleet submarines, and fewer than 100 men. The Pearl Harbor attack severely crippled U.S. naval and air strength in the Pacific. However, the three aircraft carriers attached to the Pacific Fleet were not at Pearl Harbor at the time and thus escaped. Of the eight battleships, all but the Arizona and Oklahoma were eventually repaired and returned to service, and the Japanese failed to destroy the important oil storage facilities on the island. The “date which will live in infamy,” as U.S. Pres. Franklin D. Roosevelt termed it, unified the U.S. public and swept away any earlier support for neutrality. On December 8 Congress declared war on Japan with only one dissenting vote (Rep. Jeannette Rankin of Montana, who had also voted against U.S. entry into World War I). The extent of the disaster and the unpreparedness of the U.S. military provoked considerable criticism. Adm. Husband Kimmel and Gen. Walter Short, the Navy and Army commanders on Oahu, were relieved of duty, and official investigations were begun at once. Some historians and others went so far as to accuse President Roosevelt of having invited the attack (or at least done nothing to stop it) in order to bring the United States into the war against the Axis. However, later investigations indicated that, while U.S. officials had been aware that an attack by Japan was probable, they had no knowledge of the time or place at which it would occur. Value of this source in preparation of my testimony- This source was written by Brittanica Encyclopaedia an it has all the stages and details of the Pearl Harbor attack backed up with evidence. This source also provides many ideas that our officials supported, that can justify the use of the A-bombs. Also it can be used to show the world what could have kept going if the Japanese hadn't been stopped by the United States of America! Limitations of this source in preparation of my testimony- Unfortunately, this source provides information that could be used against us such as why weren't we "on hold" as to protect our land from the enemy. Also this source was written from a general perspective but it focused more on the victim, whereas it would have been interesting to see what the Japanese government thought of this action.